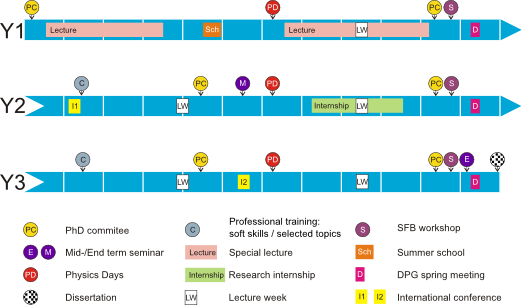 This is complemented by career-development measures, e.g., with courses for professional skills, in cooperation with the Center for Early-Stage Researchers “Ingenium” of the TU Darmstadt. Typical progress of a 36-month doctoral project starting in the summer semester. The research project (blue) represents its core. Within the first year the doctoral researcher will be offered topical lectures related to her/his project. Later the focus lies more on the project work.